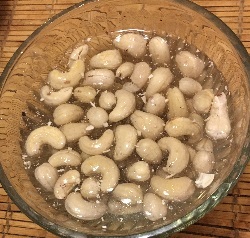 Soak your cashews 2-3 hours or longer to soften them, and if they are raw, to deactivate the anti-growth hormone and make them more digestible. In a large skillet/pan that has a lid, bring about 1/4 inch of water to a simmer, with the lid on. If the broccoli stalks are woody, slice off the woody parts off the stalks first. 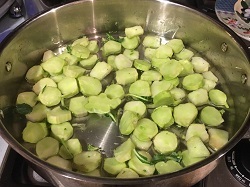 Then chop the broccoli stalks into 1/4-inch-thick rounds, adding them to the simmering water as you go. While the stalks are simmering, cut the broccoli flowers into similarly sized chunks that are up to 1&1/2-2 inches long and wide. Once the stalks are starting to be tender, add the flowers and stir them all up together, covering with the lid to steam. Add more water if needed. Drain the cashews and add them to a blender. Add the rest of the ingredients to the blender and blend until smooth. Add a little water if needed, but keep it pretty thick. 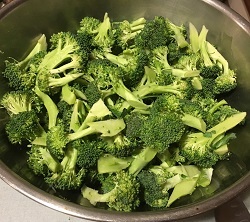 Taste to adjust seasonings, remembering that it needs to be pretty strong as it will be spread across a lot of broccoli! If necessary, drain any extra water off the broccoli and return it to the warm pan. In order to get the right proportions, you might want to set 1/4 of the cooked broccoli aside to start out. Then pour the sauce over the remaining broccoli in the pan, stirring to combine. Adjust the proportion of sauce to broccoli by adding more broccoli if needed. This is good as a warm side dish or a cold broccoli salad! It reheats well, the cashew cheese sauce thickening as it warms.